A perfect, comforting dish. 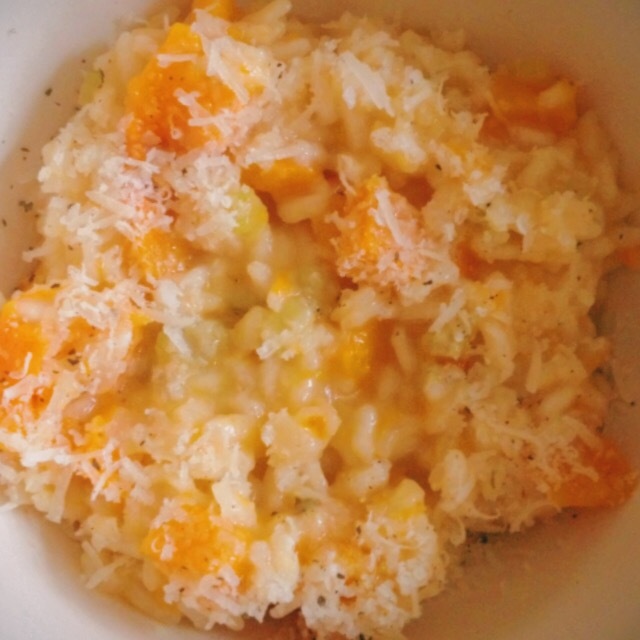 I like to roast the butternut squash first in the oven, and mash half of it into the risotto. 1/4 block Parmesan or Gran Padano cheese. 1. Peel and chop the butternut squash. This can be difficult, if like me you live on these things during autumn, I recommend buying a hardy vegetable peeler for minimal waste. 2. Roast the chunks of butternut squash at about 200c for around 30 minutes or until cooked. Mash half of the squash with a fork or potato masher into a chunky purée and set aside. 3. In the meantime finely chop the shallots, celery and garlic. Soften in olive oil in a large pan. Add the chunks of butternut squash that haven’t been mashed, and stir in the rice. 4. Add extra oil and turn the rice until it is opaque, then add the wine, stock and stir in the mashed up squash. 5. Simmer for 20 minutes until the rice is cooked and then stir in the Parmesan. Serve with more Parmesan and plenty black pepper.